Antony Rentals is centrally located in Petra, on Lesvos island Greece, just a few meters from the main square of the town, by the Beach road (check MAP above) and operates as a Rent a Car and Motorcycle company with a solid reliable name known for its good cars, good prices and immaculate service. Antony Rent a Car & Moto has a fleet of brand new cars and motorbikes and provides the best possible service with the lowest rates around. With knowledge of the Business for over15 years they make sure that the deal you get is the most suitable to your needs. 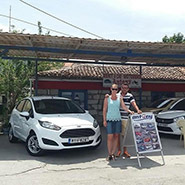 The company owns a very large variety of brand new cars and motorbikes to make sure that you will always find the type of vehicle you wish, they own the premises they are located as well as the service station where the make sure that all cars are in smooth condition and there is nothing to worry about but your pleasant and relaxing holidays. Antony Rent a Car & Moto will deliver your vehicle to the Airport, Mytilene Port or anywhere on Lesvos island you wish to have it FREE of CHARGE! Book now and enjoy our winter rates! 15% DISCOUNT for season 2016! Make your reservation through our site for this season NOW!